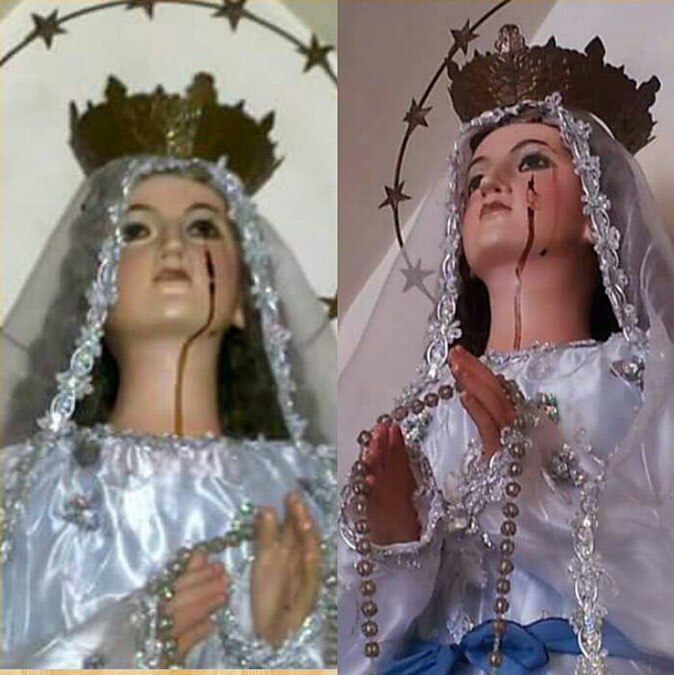 Photos of a Virgin Mary statue in Liloan in Catarman, Camiguin apparently crying, shedding tears of blood are making rounds on social media. The pictures, which were posted Tuesday, May 26, on Facebook by the Camiguin's Top Faces page, already got more than 2,000 likes and over 200 shares as of 7 a.m. today. Besides the tears of blood coming from the eyes, the page administrator said the hands of the Virgin Mary statue partly opened from its praying position. Reports said the parish priest has requested authorities to investigate the incident in order to prove or debunk the claim. According to an entry on Wikipedia, claimed phenomenon such as this one in Camiguin are "associated with miraculous healing" and the "scent of roses." "These events are generally reported by some Christians, and initially attract some pilgrims, but are in most cases disallowed by the upper levels of the Church or proven as hoaxes." "Reported weeping statues are most often of the Virgin Mary and are at times accompanied by claims of Marian apparitions. However, to date only one single example of a combined weeping statue and apparition (namely Our Lady of Akita) has been approved by the Vatican and the rest have usually been dismissed as hoaxes."